With the reunification of northern and southern China under the Sui Dynasty, east-west trade in Central Asia achieved unprecedented prosperity. This prosperity was further increased under the Tang Dynasty which came to control a vast area of Central Asia (having overthrown the Qu-shi Gaochang Kingdom (498-640) in Turfan in 640 in addition to its subjugation of other countries in the region). The Tang installed a Protectorate General of Anxi to serve as the base for the management of trade in Central Asia. It also established a Protectorate General of Beiting in 702 to prepare against attacks from Turkish tribes based in the Dzungarian Basin to the north of the Tian Shan mountains. Tang Dynasty influence over Central Asia can be seen in the antiquities found in the ancient cemetery of Astāna, to the north of Kara-Khōja (Sketch Plan of Kara-Khōja by Grünwedel(2), Sketch Plan of Kara-Khōja by Stein(3)), at the Ancient Cemetery of Astāna(4). These antiquities showing a clear Tang influence include Clay Figures(5) and Silk Paintings(6). In addition, Chinese-style Wall Paintings(8) can be found in the Kumtura Thousand Buddha Caves(7) as well. 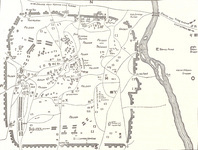 Tang power over the area quickly waned after its defeat against the Arab Abbasid Caliphate at the Battle of Talas in 751. This devastating defeat was then followed by the chaos within China following the the aftermath of the An Shi Rebellion from 755 to 763. With China in chaos, in 786, the Tibetan Tubo Kingdom (07) seized the Hexi Corridor (05). Occupying both the Protectorate Generals of Anxi and Beiting, they therein expelled the Tang from Central Asia. The second period ruins of the Mīran site (07) is that of a Tibetan fort. 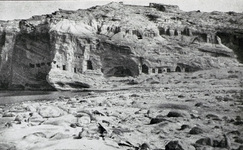 The ruins of Dandān-Uiliq (near Khōtan (03)) were of a city also deserted at the time of Tang withdraw from Central Asia and the desertion of the city is thought to be linked with the end of Tang power in the region.